Spring Valley arrest video: Female student used phone before incident, classmate says. 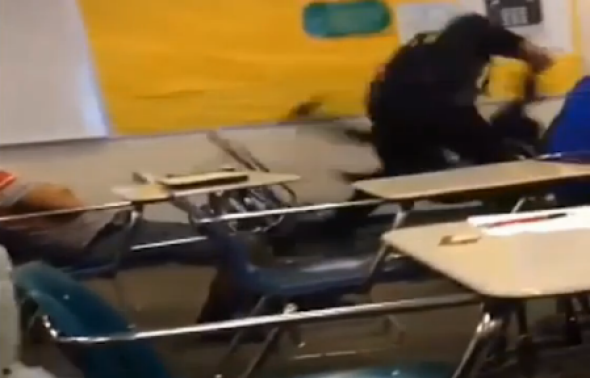 A still from one of the videos of the incident at Spring Valley HS. The officer in the video has been identified as Ben Fields. Around 10:30 a.m., the girl who had the confrontation with the officer was working on her computer, and had her phone out, Robinson said. He said the teacher asked her for her phone, but she said no. An administrator was then called to the room, and Robinson said he pleaded with the girl to get out of her seat, but she didn’t. At that point, Robinson says, school “resource officer” Ben Fields entered the room, but the student facing discipline still refused to get up. Fields is a deputy in the Richland County sheriff’s department and has been placed on administrative leave.